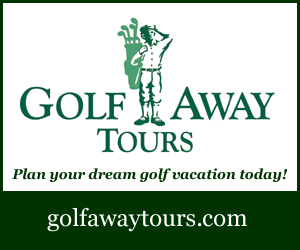 As a golf and travel writer, it’s natural to develop preferences for destinations based on key factors; the quality of golf and accommodations, the travel process, non-golf attractions and of course, food. Scottsdale, Arizona has always ranked highly in all those areas and as such has become one of my favourite spots to visit. 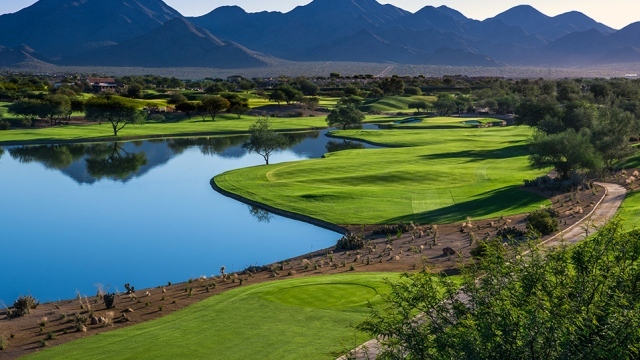 So it was that I returned to Scottsdale last spring for a short stay to experience some wonderful Southwestern hospitality and enjoy some unique golf. There’s no shortage of direct flights from Toronto to Phoenix, especially in the cooler months and before you know it, you’re getting rid of that extra sweater and putting on sunscreen. 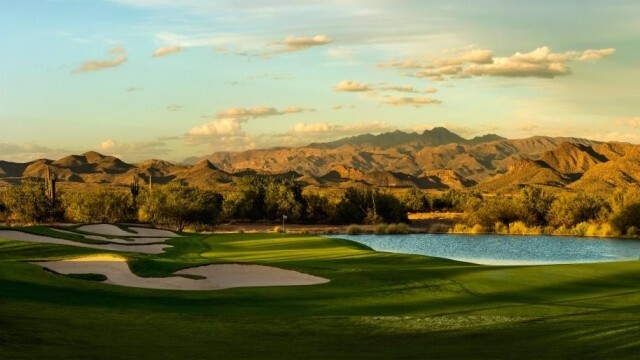 Phoenix Sky Harbor Airport is ideally located if you’re on a golf vacation too, as it’s just a few minutes to the closest courses in Scottsdale. Even closer than I thought as it turned out. After a short twenty-minute ride, I was enjoying a cool beverage on the patio of Mountain Shadows Resort overlooking the first tee and chatting with Director of Golf Tom McCahan. The Short Course at Mountain Shadows aims to be “the best par 3 course in America” and while I obviously haven’t enjoyed them all, I’d say it’s certainly one of the best I’ve ever played. 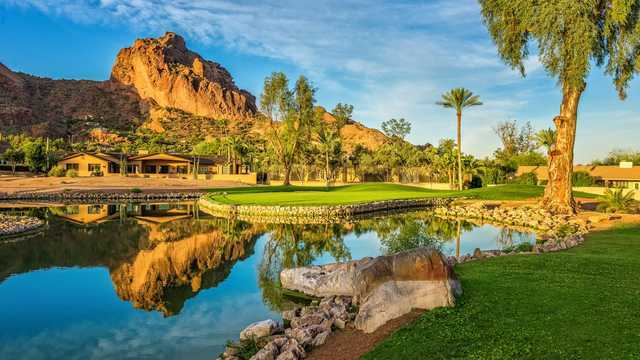 The course is set on the edge of Camelback Mountain and winds around the resort community, rising and falling with the rugged slopes of the desert landscape. The entire course tops out at just over 2300 yards from the tips with individual yardages ranging from 75-193 yards. The greens average about 5500 square feet, which is small by championship course standards but they’re heavily contoured, well bunkered and on the day we played, pretty slick. With names like Plunge, Climb, Biarritz, Punchbowl, Oasis, Dell and Scotch Notch, you get an apt description of what the holes look like plus the names add a sense of fun and adventure. As I’ve written before, golf needs courses like this for every level of player. They don’t require a lot of land (34 acres), they’re great for beginners, and most of all they provide a welcome break from the typical 4-5 hour round. Tom and I were done in less than two hours! The Short Course was designed by architect Forrest Richardson and includes an unusual twist late in the round. There’s an extra hole between the 17th and 18th called the Forrest Wager – a betting hole. It’s a long narrow green that slopes downhill and has a couple of knobby bumps along the way. You can chip to the flag or start your wager on the green. For anybody that loves long snaking putts, this will really test your skill. A lot of golfers will be heading farther north to play the better-known championship courses in Scottsdale but keep Mountain Shadows in mind. You could easily play it on your arrival day or make it a quick last stop before you depart. It’s definitely worth a look. My accommodations for the first two nights in Scottsdale were at the luxurious Westin Kierland hotel, another favourite. I like the rooms that overlook the final hole on the Acacia nine – it’s a magnificent view looking right up the length of the big, sweeping par-5 and from high up in the hotel you feel like you’re right on top of the green. If that doesn’t get you in the mood to play golf, nothing will. The Kierland has a lot of things going on all the time from conferences to shopping to dining and everything in between. There’s the Scotch Library (more on that later) and an enormous outdoor patio that is a wonderful place to eat and hang out well into the warm evening, not missing the cold spring temperatures at home in the least. Something I discovered on my latest trip is that the Kierland is an old family hotel, founded by the Herberger family in the 1950’s. If you’re into local history, there’s a fascinating art exhibit and family legacy displayed in a gallery on the bottom floor. Kierland has three nines, Acacia, Ironwood and Mesquite, and they’re all very friendly – generous fairways, no forced carries and large greens. There’s enough bunkering and water to make things challenging but each nine is fun to play and definitely won’t leave you feeling beaten up. One of the unique things about the Kierland golf course is that it has more ways to get around than anywhere else I’ve ever played. You can ride a motorized cart (so mundane) or choose something more exotic like a Golf Board, a Segway, a golf bike or a Turf Rider. Tough choice – but I went with the Turf Rider. 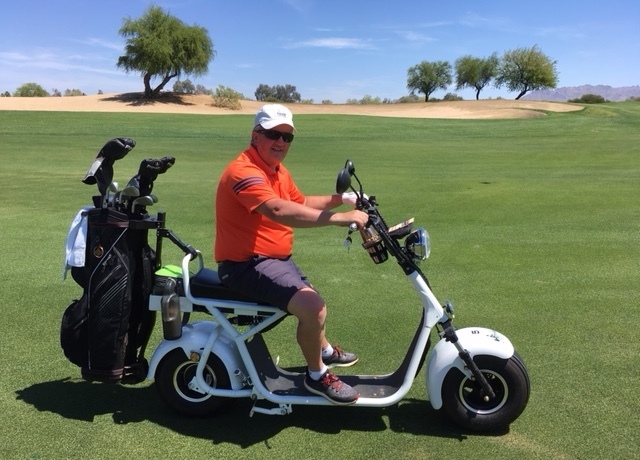 OK, so it wasn’t a souped-up Harley but it was pretty cool to scoot along the cart paths and fairways, wheeling up to my ball, then peeling off into the morning glare, squinting through my shades as the wind whipped through my hair. Back to reality: The Turf Rider is easy to operate and can go just about anywhere. The fat tires are eco-friendly and the little electric motor moves you along faster than a golf cart. Although I prefer to walk generally, I’d certainly go for the Turf Rider anytime walking isn’t an option. My next round had me on the first tee at TPC Scottsdale’s Stadium course early the following morning. 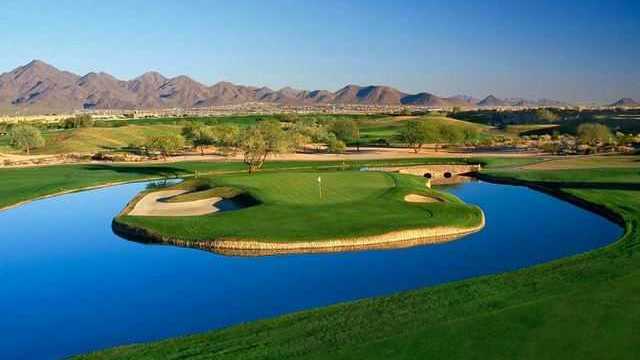 Most readers will be familiar with this gem as the host of the Phoenix Waste Management Open. It’s a classic Tom Weiskopf / Jay Morrish design and, in my opinion, one of their best. The land is quite flat but they’ve made it interesting with mounds, ponds and quirky elements like the driveable par-4 17th. According to many, “the golf course really starts on the 15th” and while the finishing stretch is a string of terrific holes, the first 14 shouldn’t be discounted so easily. Maybe because they don’t get as much TV time, people tend to forget them but Weiskopf and Morrish have crafted some real beauties in this part of the Sonoran Desert. However, every Super Bowl Sunday, millions of eyes are glued on that final stretch that includes the loudest hole in golf, the 16th. If you’ve ever been to the tournament, you know how loud it can get with about 20,000 screaming, over-lubricated fans. In any other week, not so much. Without the stadium encircling the hole, without the screaming fans and the pressure of a PGA Tour championship, the 140-yarder is just that. Pretty easy 9-iron, two putts, easy par. I said to my host, maybe they should have a button you can push for some crowd noise. Or better yet, leave the stadium up permanently and add some giant video screens running loops of screaming fans, at a slightly lower decibel level of course. Now that would be COOL! Even without the fans and the stadium, it’s a really fun finish to a very strong course. The Fairmont Scottsdale Princess was home for the next two nights. 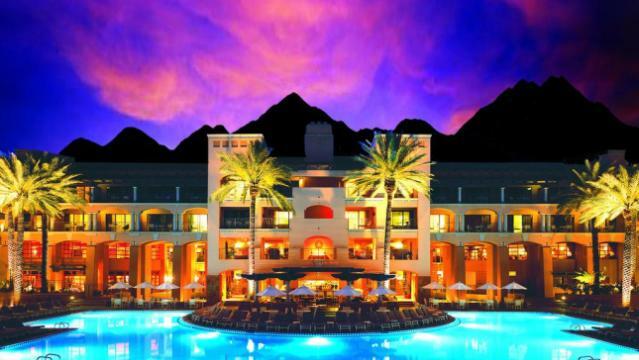 It’s a massive hotel complex with restaurants, bars, a fantastic spa, multiple mid-rise buildings and dozens of casitas each containing 4-6 suites, plus pools, ponds and tennis courts, all spread out over acres and acres. I’m not even sure it’s all in the same area code. I was in a wonderful casita suite about a John Daly drive away from the shops and restaurants but to my delight there was a special room right next door with complimentary all-day snacks and drinks available and a very special level of personal service. It’s called Fairmont Gold. It’s amazing! My last round of golf had us at Verde River Golf & Social Club, about 40 minutes north of the Fairmont. Formerly known as Tegavah Golf Club, the course went through some tough times but new owners with very deep pockets have pushed ahead with development of the surrounding community and thanks to a Tom Lehman facelift in 2017, the course is a real treat to play. There are stunning views of the Tonto National Forest and the Four Peaks and lots of Sonoran Desert to ponder. The course is close to Troon North and would make a wonderful addition to the two fine courses there but you better hurry. Verde River is planning to become a private club. One of the hazards of golf and travel writing, apart from snakes, alligators and lost luggage, is the spectacular hospitality offered at each destination. My burgeoning waistline is a tribute (victim?) to both the qualitative and quantitative food and beverage events that are part of every itinerary. I’m not a gourmet by any means – heck I can’t tell a Béarnaise sauce from a Béchamel – but my parents always said to clean my plate, so I courteously, if not eagerly, eat everything put before me. And enjoy it! My latest sojourn to Scottsdale was no exception. After golf at Kierland, we relaxed at the Brittlebush Bar & Grill, which is part of the golf clubhouse – barely a wedge shot from the main hotel. The Brittlebush offers spectacular views of the Ironwood nine from its patio, and inside, the Southwestern motif offers a hint of the menu including lots of local delicacies. While there are more formal dining options at the Kierland, the Brittlebush is perfect for lunch or a casual dinner. Over at TPC Scottsdale, the Toro Restaurant & Rum Bar is in the clubhouse. It’s a collaboration with celebrity chef Richard Sandoval and offers “Pan-Latin cuisine suffused with Central and South American flavours.” I can only imagine what all that might include but the grilled fish I had was excellent. Finally, the Fairmont Scottsdale Princess has several dining options and on this trip we enjoyed a tasting menu in La Hacienda, which is billed as “Scottsdale’s Best Mexican restaurant.” It more than lived up to its billing. The bustling restaurant is like a huge party – with lively music, lots of laughter, and best of all, maybe the world’s biggest tequila bar. There’s even a Tequila Goddess to teach you all about the agave nectar and provide well more than enough samples. Who knew there were so many different tequilas? If you’re sensing a pattern here with the Scotch Library, Toro’s Rum Bar and the Tequila Goddess, it’s not a coincidence. 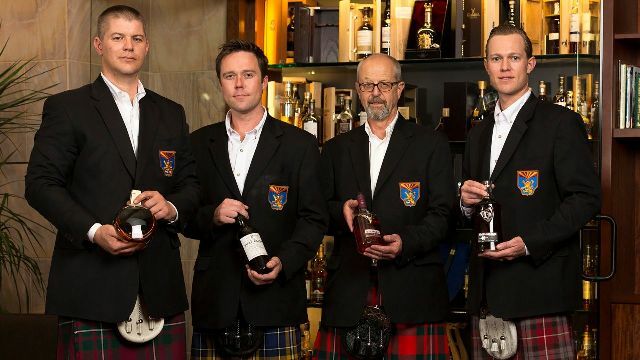 Apart from offering more than the usual number of choices of their respective beverages, each of the bars also has experts on hand to discuss the finer points of distilling or to teach the relatively uninitiated a few pointers to get them started. I’ll cover more about this in a future issue but suffice to say, the education provides an intriguing sidelight to dinner. As usual, all of these golf trips end too soon. 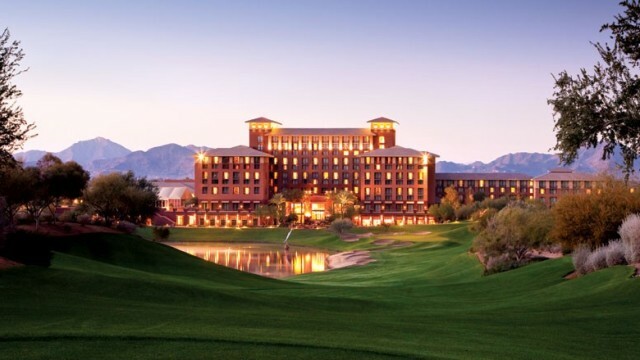 A Scottsdale itinerary could go on for weeks with all of the excellent hotels and golf courses in the region. Perfect for couples, buddy trips or large groups, there’s no end of entertaining opportunities. I didn’t even mention spas or shopping. If you’ve never been, I hope you’ll add Scottsdale to your future plans. You won’t be disappointed. And if you have visited in the past, then you know how good it us. It’s time for a return visit. One of the best Don. Wow, Peter, so glad to see you enjoying the best of golf. We must visit the Scotchbar together some day. After golf that is. Thanks for the superb article. Scotch Library, Rum Bar, Tequila Bar – they provide an entire new look to our old pub crawls.